“It is better to dwell in the corner of the housetop, than with a brawling woman and in a wide house.” (KJV). If you had a choice between living in a big house and living in the corner on a roof, which would you choose? I believe most people would choose to live in a nice big house. But as Solomon is wont to do, he puts a little twist in his Proverb and says that it’s actually better to live on the roof… if there’s a brawling woman in that house! But – what does the word brawling mean? If you look at some of the other ways this word is translated in other versions of the Bible, it reads: quarrelsome, contentious, nagging, and bitter-tongued. In other words, Solomon is talking about a contentious wife who likes to fight, nag, and stir up strife. If that’s the case, you would be better off on the roof, out in the cold with the wind and rain. If you ask me, neither one of these options sounds like fun! How then should we apply this Scripture verse to our lives? To the married men: If you have a wife who is peaceable, then thank the good Lord above. You are blessed! Proverbs 18:22 says, “Find a good spouse, you find a good life – and even more: the favor of God!” (The Message). 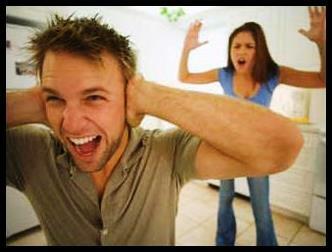 However, if you have a wife who tends to be contentious, then pray for her. Pray that the Lord Jesus would change her heart, and that she would have the fruit of the Spirit in her life – which includes peace, kindness and gentleness. To the married women: If I can be so bold as to give you a piece of (Scriptural) advice: Don’t be a nag! If you criticize and complain to your husband all the time, then don’t be surprised if he wants to spend all of his time out in the garage with his tools, watching football with the guys or being anywhere but with you. It’s no fun being around a woman who fights all the time. A Post Script: Now lest some of you conclude that the Bible is picking on the women here, know that there are many Scriptural admonitions to the husband as well: Husbands are commanded to love their wives as Christ loves the church (Eph. 5:25), to love her and never treat her harshly (Col 3:19), and to treat her with honour (1 Peter 3:7). The bottom line? If a wife will respect her husband, the husband will love his wife, and if the husband will love his wife, the wife will respect her husband (Eph. 5:33). Amen! This entry was posted on Friday, September 20th, 2013 at 12:00 am	and tagged with Bible, Book of Proverbs, Christianity, faith, God, Jesus, marriage, proverbs, Religion and Spirituality and posted in marriage. You can follow any responses to this entry through the RSS 2.0 feed.